Perry's Tuxedos, owned by David Perry, opened in a storefront next to Benny's Bakery in downtown Saline. 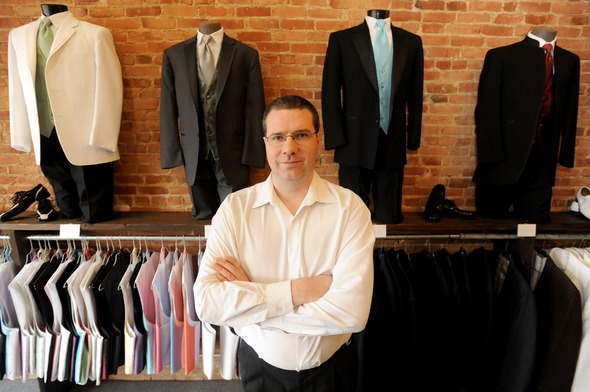 He worked at his dad's formal wear store in high school and beyond, and now David Perry has opened his own emporium of celebratory clothing, Perry's Tuxedos, in downtown Saline. The Michigan Avenue shop, which specializes in tuxedo rentals and sales, celebrated its grand opening on Jan. 12. Perry, 35, calls it an "expansion" of Perry's Tuxedo, which his father has run in Adrian for 21 years. Perry's venture is not exactly new, but the location is. He owned a formal wear store in Owosso, also Perry's Tuxedos, for two years or so, while also holding down a job at Hollywood Video. A promotion with that company came with a transfer to Jackson, his wife Jennifer's hometown, and it meant being closer to his dad, so he shut down the store. When Hollywood Video liquidated soon thereafter, Perry moved to Saline to be closer to his dad, David, and his wife's family. Perry, the father of three young children, began working full time for a Livonia tuxedo supplier, a company he knew through his father. He worked there on and off for about 10 years, and eventually made another go of retailing. He left the company and opened Perry's Tuxedo Plus in the 1,600-square-foot space formerly occupied by the Calico Cat, which closed in August after its owners retired. Aside from creating a partition to keep changing rooms and the stock room separate from the showroom, Perry's investment in renovations was negligible, he says. At the moment, before prom and wedding season are in full swing, Perry is the sole employee of his store, but he may hire additional help as needed. Perry's store offers a "nobody beats my prices" guarantee. Tuxedo rental ranges from $70 to $125; the average purchase price of a tuxedo, depending on the brand, runs $250 to $700. The Saline Chamber of Commerce is happy Perry chose Saline. Julie Edgar is a freelance writer for AnnArbor.com. Mon, Jan 16, 2012 : 4:49 p.m.
Congratulations on your Saline business adventure. Best of luck to you.